Crawley Town have a break from their League 2 programme this Saturday when they contest the first round of the FA Cup. Reds will be making the long trip North to Wigan Athletic to play the high-flying League 1 club. 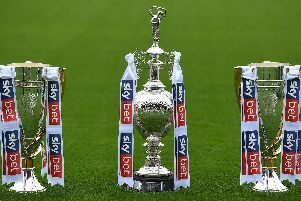 The Latics won the competition in 2013 when they were in the Premier League and have twice won the Football League Trophy. Managed by former Portsmouth boss Paul Cook, they are currently second in the table in the division above Crawley, League 1. Their topscorer is former Leicester City and Manchester United player Nick Powell with seven goals. Crawley twice stunned the football world by reaching the fifth round in 2011 and 2012 when they went out to Manchester United and Stoke City respectively. After reaching those heights, which included several wins against higher-rated opponents. Reds have struggled to make an impact in the competition. Last year they went out in the first round against another League 1 side Bristol Rovers, losing 4-2 away in the replay after drawing 1-1 with the Pirates at the Checkatrade Stadium. Kewell acknowledged the difficulty of the challenge in playing such a big club from higher up the pyramid. The Reds boss likes to play against the leading opponents and reckons this game presents his team with a good opportunity to show what they can do against higher-rated opposition. Kewell calls upon the players and the fans to go and enjoy themselves during their trip to the DW Stadium. He said: “But I’ve always been a believer that when you enter a competition you want to play the best sides and that’s exactly what we’ve been given the chance to do.